In February 2013 I was banished from the relative sophistication of Three Bridges to the back of beyond that is East Grinstead, and set to remain there for up to 2 years, I thought I would use the time to chronicle the comings and goings over the railway into the town. Despite East Grinstead being only 440 yards further from London Bridge than Three Bridges the fastest train in the morning takes almost an hour as compared to 35 to 40 minutes. On the plus side it is quite scenic, especially the climb through the Surrey Hills and there are the three wrought iron and steel truss viaducts - Riddlesdown, Oxted and Cook's Pond - which are rather unusual in SE England and, of course, the reconnection of the Bluebell Railway to the national network, after almost 50 years of isolation, is an exciting development. 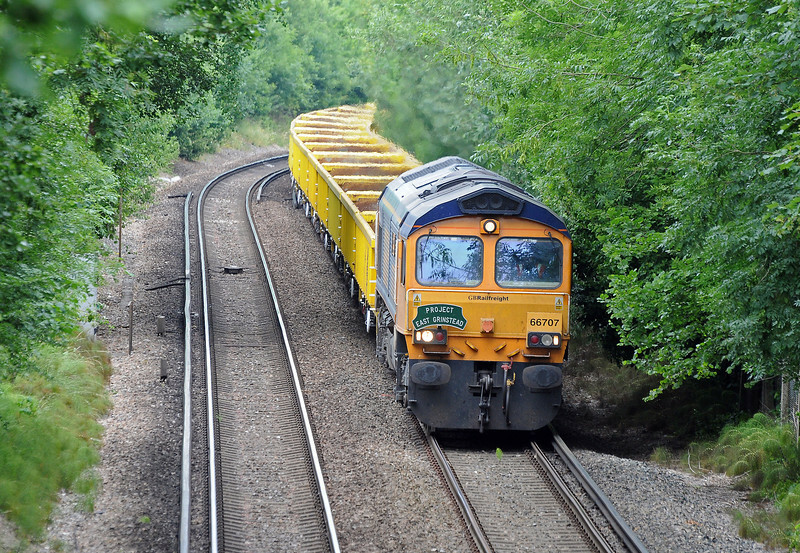 It was in July 2010 that GBRf started running the spoil trains to remove excavated material from Imberhorne cutting, the last obstacle preventing the Bluebell Railway reaching their Ultima Thule, East Grinstead. On July 7th, and sporting an appropriate headboard 66707 approaches East Grinstead with the second or third train of the series.